U.S. consumers spent $9.5 billion on vodka in 2003. $950 million of this was spent on ultra-premium vodka, such as Grey Goose, Ciroc and Ketel One. This begs the question: What’s the big friggin deal with vodka? Vodka originated in either Russia or Poland, depending on whom you ask, a Pole or a Russian. Vodka is the diminutive form of the word voda, which means water. So vodka can be roughly translated as, “dear little water.” Dear little water indeed. Vodka, by definition, is a neutral distilled spirit. It’s basically colorless, odorless and tasteless. Of course ‘tasteless’ doesn’t refer to the effect that vodka’s 40 or 50 percent alcohol content has on your tongue. Contrary to what many of us have heard, vodka isn’t distilled from potatoes. Most vodka is distilled from grain; including wheat, rye, barley and corn. Again a question: How does this relatively humble, yet powerful liquid generate $9.5 billion in sales? My best guess: Marketing. The next time you leaf through a magazine notice how many vodka advertisements there are. Most vodka ads convey sophistication, sexiness, and style. Stroll through the liquor store and take a look at the premium vodkas. Some look as though they have been bottled in priceless crystal decanters. Others look as though a Swedish minimalist designed ultra-chic aluminum bottles to hold the stuff. With vodka, it’s all about appearance. To prove (or disprove) my point, I purchased five different brands of vodka; two luxury vodkas, two mid-range vodkas and one bottle of ‘rotgut’ vodka. My intent was to compare all of them in a blind tasting – a sort of Pepsi Challenge with vodka. The luxury vodka lineup consisted of Ciroc and Absolut. Ciroc is in a beautiful bottle with purple glass at the bottom and a purple bauble embedded near the bottle’s neck I know, I know, I’m a sucker for purple. This is French vodka whose claim to fame is that it is made from French Grapes and distilled a whopping five times (although how multiple distillations of a neutral liquid do any good is beyond me). Ciroc rings in at a cool thirty bucks for a 750ml bottle. Absolut is the well-known premium vodka from Sweden. On the bottle’s front, elegant text touts its ‘superb’ origins from the ‘rich fields’ of southern Sweden. Absolut will set you back twenty-one dollars. The mid-range vodkas were the old standby Smirnoff of Russia and Canada’s Polar Ice (not to be confused with the chewing gum of the same name). Smirnoff boasts 50% alcohol, or 100 proof, which makes it the most potent vodka in the lineup. Smirnoff is bottled simply with the label “III/X” to draw attention to its triple distillation and ten-time filtration. All this purity for only $15. Polar Ice Vodka pulled out all the marketing stops on its bottle. The label includes the following blurb, “Made of the finest grains; quadruple distilled in a state-of-the-art pressurized extractive distillation process to impart an exceptionally unique and smooth finish.” Sheeesh. Of course this makes it seem like a steal for only sixteen dollars. Finally, the, ahem, value-priced vodka was Barton vodka. “Charcoal filtered 100% neutral spirits distilled from grain.” Barton is made right here in the US of A and retails for about $6. It comes in a humble plastic bottle. Appearance: all five vodkas are clear. I suppose I could have skipped this step. Scent: The vodka vapors literally curled my nose hair as I sniffed each glass. With the exception of two, I couldn’t detect any differences. One glass of vodka didn’t seem quite as pungent as the others (read: My nose hair only received a body wave instead of a permanent). This turned out to be Absolut. Another glass had a slightly sweet scent. 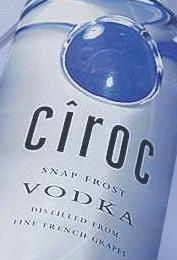 Interestingly enough, this one turned out to be Ciroc; the vodka made from grapes. Taste: In all honesty I had planned on sipping, swishing, swirling and spitting-out each vodka sample. Easier said than done. The sensation of swishing around vodka inside one’s mouth is not especially pleasant. I resorted to Plan B: I took a tiny sip of each one. Each sample tasted like, well, vodka. Actually, there wasn’t a taste per se; it was more a strong burning feeling in my mouth. I couldn’t detect the stronger vodka (the 100 proof Smirnoff). The six-dollar vodka felt just like the thirty-dollar vodka. I conclude while luxury vodkas look neat in their snazzy bottles, they don’t represent any concrete step-up in texture, flavor or finish. I’m sure there are vodka connoisseurs out there who swear by their favorite brand. 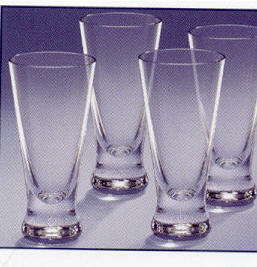 To all of them I say this: Line up three or four glasses of different vodkas and see if you can pick out your vodka. As for me, I plan on doing two things. First, I will stick to sipping wine rather than vodka. Second, I’ll keep the nifty bottle of Ciroc and when it runs dry, I’ll refill it from my humble plastic bottle of six-dollar vodka. No one will ever know the difference. Na Zdorovia! Did you chill the vodka before serving? There should be a discernible difference in vodkas if they are served in the right conditions. It's unfortunate you didn't try a potato vodka. Chopin has a very interesting flavor. beau - i absolutely looooove that you did this!! i am 100% convinced that if i put a glass of belvedere and a glass of *ahem* "rot-gut" (love that) in front of people who "only drink top-shelf," they wouldn't know the difference. how embarassed would they be??! and yet, i always order absolut citron with my soda. i wonder why? totally a brand-marketing thing, eh? by the way, a friend of mine told me about his friends who really ARE vodka-snobs and swear that they CAN tell the difference...BUT did admit that IF you run the $3.99 white label, black block lettered "VODKA" through a Brita filter (the kind used to filter water), it DOES taste as good as the $$$ ones. isn't that crazy? When combined to form mixed drinks different Vodkas seem to have different flavores to me, but nothing approaching the variety of wine. Temperature matters too. Do a shot of 8 buck jug vodka. Then do a shot of a premium vodka and you will notice a difference. Cheap stuff burns, tastes bad, expensive stuff is smoother. I don't think that taste is really the proper way to judge it. Purity is more important. If you should so choose to consume more than a sip in an evening you will also notice that cheap vodkas reap havoc on your head while better brands will give a hangover, but not nearly as bad. Finer filtration (a la luxury vodkas) will remove more congeners - the hangover/headache causing components in alcoholic bevs. However, neutral is still neutral.. Please, I ask some vodka lovers to try the blind tasting and see how they do. We're all very curious! Well the purer and more filtered and distilled the better for your liver I assume. Also better for your mouth and throat if you fall asleep without brushing your teeth. I have seen the awful looking stuff I see on my tongue after a night of wine drinking or whiskey drinking. Plus the stuff that starts growing in your throat overnight. lol. That's why I prefer Vodka. It is apparently true that it is "cleaner". All things considered, yes - less congeners (impurities) equates to less of a hangover. However, 80 proof (40% alcohol) can spin your head and liver much quicker than a 14% alcohol glass of red wine! I can attest to the missing hangover. I use one of the Vodkastick filters for my vodka and almost never get a hangover. The alcohol feeling is very clean, like a great bottle of wine. a Vodkastick? It really works? Hmmm. Can you explain the details? Vodka is essentially nothing but pure alcohol and water. It doesn't have all the nasty junk that dark whiskey like Jack or Beam has. So you definitely get much less of a hangover. Now flavored vodka, that can get to you. The flavorings and other additives they use make you feel like you got the crap beat out of you. The Blogs are turning out to be very well-liked. The increasing speed of blog’s demand will confuse your mind. Why? For what is so? Why does a person like to grow into a blog writer? Bloggers also need nice visitors to read their written blogs,and i hope the same thing for this blog. Th vodka fermented through the hlp of potatoes I nver knew that...thought I should share it with those who are unaware ! You are a real vodka man and sure know a lot about in detail then i hope you are aware of it's side effects too.